Uncovering the secrets of the environmental past – you can help! 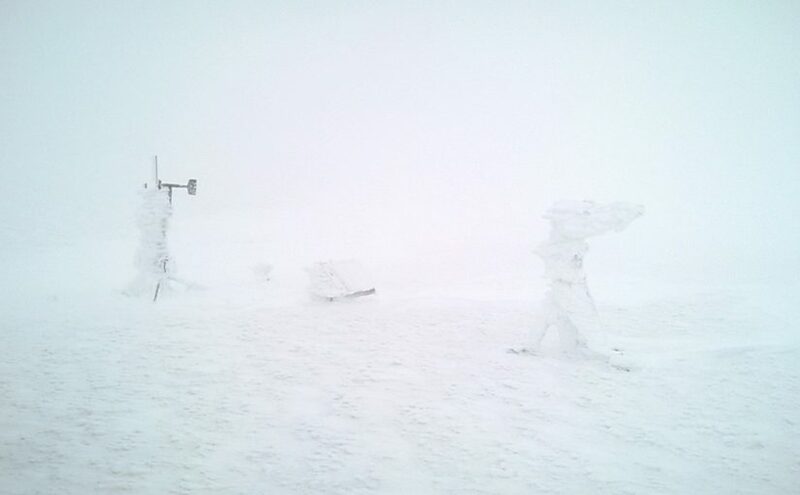 Weather Rescue project is seeking volunteer citizen scientists to bring historic weather observations into the reach of digital science. Millions of meteorological observations are waiting for volunteers to enter them into digital format, and so make then accessible for climate research. 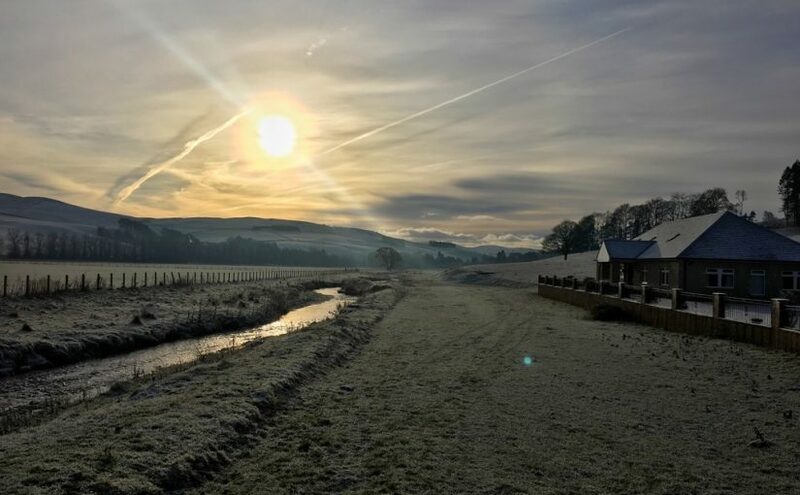 And of course where improvements in climate research take place, there’s scope to improve hydrological understanding too – not least extremes of wet and dry. See the feature article and the link to the project here on BBC news. Post your comments here if you’d like to share your efforts as part of a Dundee team effort. Posted on 7th December 2017 7th December 2017 Author Andrew BlackCategories UncategorisedTags Citizen science, Historic recordsLeave a comment on Uncovering the secrets of the environmental past – you can help! Power availability is the big challenge at 900 m elevation. The Wildland mountain observatory on Druim nam Bo benefits from a 60 W solar panel and a wind turbine generator, with 220 Ah of battery capacity. Ben Pickering’s disdrometer, pictured here in the foreground, needs 1 Amp of current, so sometimes there isn’t enough to go around (for long). 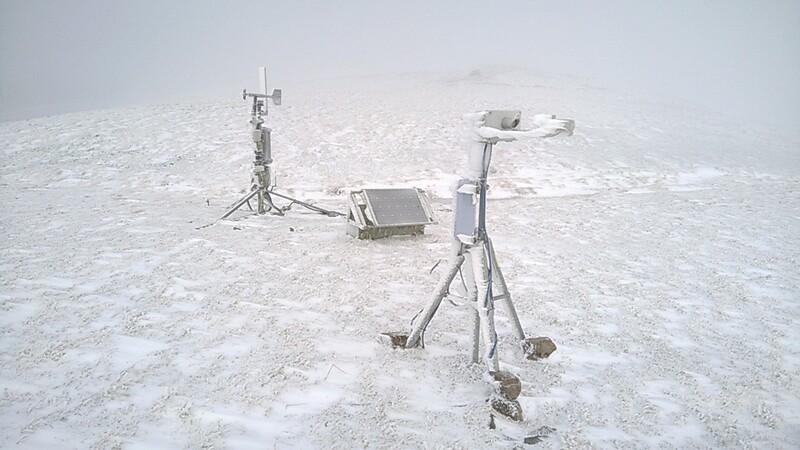 A low voltage disconnect (LVD) stops the power to the disdrometer when reserves get too low – leading to this icing-up spectacle on 19th November – while the weather station continues unabated. Since then, conditions have improved, so hopefully laser radiation is once again analyzing the precipitation – solid and liquid – as it falls. Latest data are here. 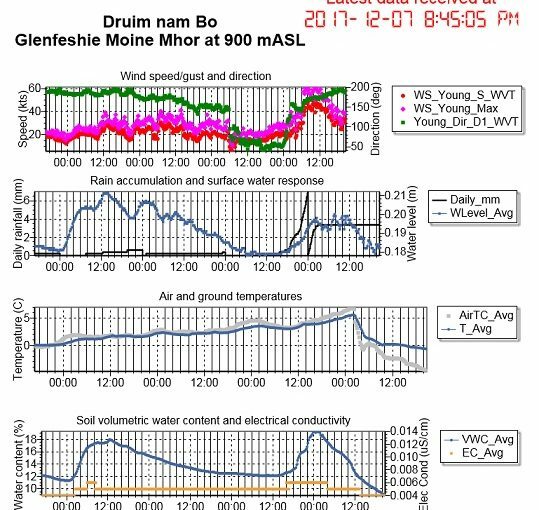 After 10 days of continually freezing conditions at the Wildland mountain observatory on Druim nam Bo, warm air on Saturday brought a thaw to high altitudes – and significant melt. 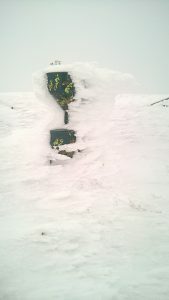 Some 41.2 mm of snowmelt was recorded through the rain gauge. 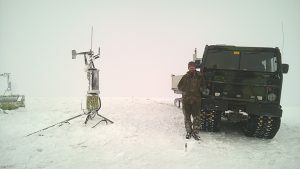 The ground had been frozen and gradually climbed above zero – escaping from freezing some 16 hours after the air temperature. 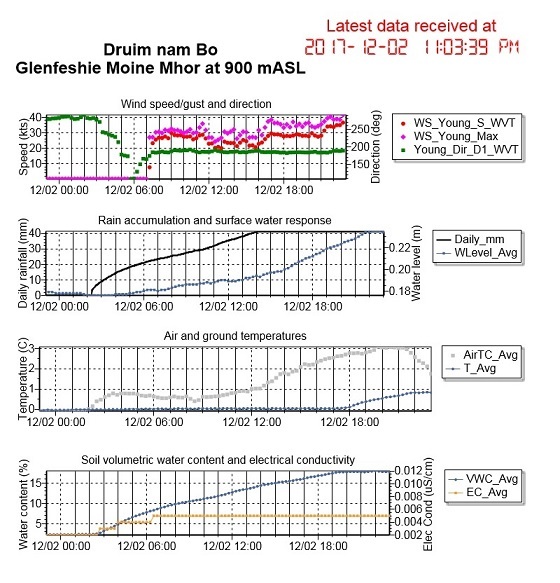 Water level in the adjacent pond rose some 5 cm, soil moisture content rose from 2% to 18% – though the initially low value may be a reflection of freezing conditions. The rise in pond level began 2 hours after thaw began to be recorded by the rain gauge.